The researchers behind a workplace wellbeing survey tool are looking forward to full rollout of the tool in 2018 after a successful pilot survey of junior doctors in Wessex, South England in November. The MyDay survey was developed by a research team led by Postgraduate Dean at Health Education England (HEE) Wessex, Peter Hockey, together with Amanda Goodall from the Cass Business School, City, University of London and Rhema Vaithianathan of CSDA. 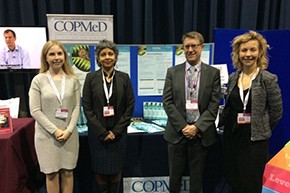 In November, researchers from HEE Wessex and CSDA presented on the development of MyDay and preliminary results from the pilot survey at the Developing Excellence in Medical Education Conference in Manchester. MyDay asks employees to reconstruct parts of recent workdays: what they were doing, for how long and how did they felt while doing it. Rhema Vaithianathan says strong interest in the survey from the junior doctors has encouraged the research team as it works towards full rollout. “We had a 35 per cent response rate from the 550 junior doctors we invited to take part in the pilot. Their take-up allowed us to test and refine our recruitment process, but also delivered some interesting preliminary data. Are some tasks universally liked or disliked by employees? How do an individual’s feelings about tasks vary across time? How do feelings about tasks vary between employees? What characteristics of individuals and workplaces best predict how people feel about their tasks? What impact does the daily experience have on overall job satisfaction, productivity and intention to quit? The first full MyDay survey is planned for mid 2018; around 2000 (non-pilot) trainee doctors in Wessex will be invited to take part. Visit the MyDay website for more information about MyDay, and read the MyDay Pamphlet for preliminary findings from the Wessex pilot study.